The icon of Australia is the world's second largest free standing monolith. Ayers Rock rises solitarily 348 meters (1141 feet) above the desert plain and is over 9 kilometers (5 miles) in circumference. It's also known for its sacredness and changing colors. 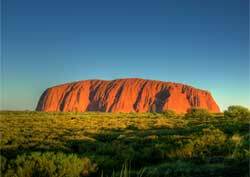 Ayers Rock's official appellation is Uluru, the one given by the Anunga Aborigines of Australia. Note: I use "Ayers Rock" in my website because it's far, far more recognized than "Urulu" by travelers around the world. That's mid-December to mid-March in the southern hemisphere. Average midday temperatures are close to 38°C (100°F) and have soared as high as 45°C (113°F). Remember, you're in a desert. The rock is sacred to the local Anunga Aborigines. The Anungas discourage (but do not prohibit) visitors from climbing their sacred mountain. Roughly 1 out of 10 visitors do climb the rock, using an ancient Aborigine trail. A few slip and lose their lives each year. Once on top, the view is staggering. Note: The trail is closed when it is windy, rainy or excessively hot. There are several interesting ground level paths. One stretches completely around the monolith. An Aborigine guide will explain his culture's mythology relating to the rock and will show you rock paintings.